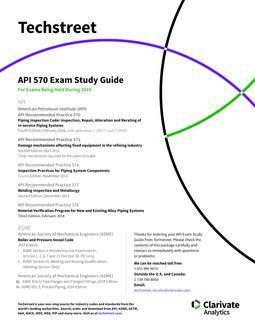 This package includes all the API and ASME exam materials required for the API 570 Certification Exams being held during all months in 2019. Please be sure you will be taking an exam during this time period before purchasing. API Recommended Practice 577, Welding Inspection and Metallurgy, 2nd Edition, December 2013. API Recommended Practice 578, Material Verification Program for New and Existing Alloy Piping Systems, Third Edition, February 2018. American Society of Mechanical Engineers (ASME), Boiler and Pressure Vessel Code, 2017 edition. i. ASME Section V, Nondestructive Examination, Articles 1, 2, 6, 7, 9, 10, and 23 (section SE-797 only). i. ASME B16.5, 2017 edition. ii. ASME B31.3, Process Piping, 2016 edition. 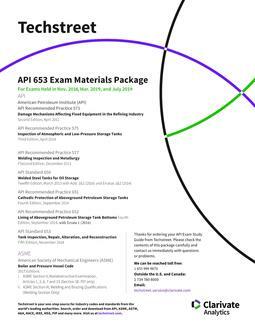 The prices above reflect special discount for API exam candidates.